So here’s the scenario, you’ve been told that there are machines showing a network adapter with an exclamation and error in windows device manager. The task is to get a list of the machines using ConfigMgr 2012 which are affected by this and then you can work on narrowing down the problem. It may be a particular machine model, a bad driver you have, who knows. Until you can identify the machines with the issue you’re going to struggle to find the root cause. So, this is where the power of ConfigMgr comes into play. Administration>Client Settings, hit properties from the ribbon and select Hardware Inventory. Now expand Network Adapter and select the ‘Config Manager Error Code’. Click OK. If you want some further info on the Win32_NetworkAdapter WMI class then go here. That query will essentially show you any record that has an error code value of anything other than 0 (zero) for a ‘Microsoft Teredo Tunneling Adapter’. If you comment out the WHERE line (with — before it) you can browse the available network card descriptions for your estate. Don’t forget to change the CM_TST value to represent your site name. Go to properties of your collection, select the Membership Rules tab and select Add rule, query rule. Give your query a name and select Edit Query Statement. 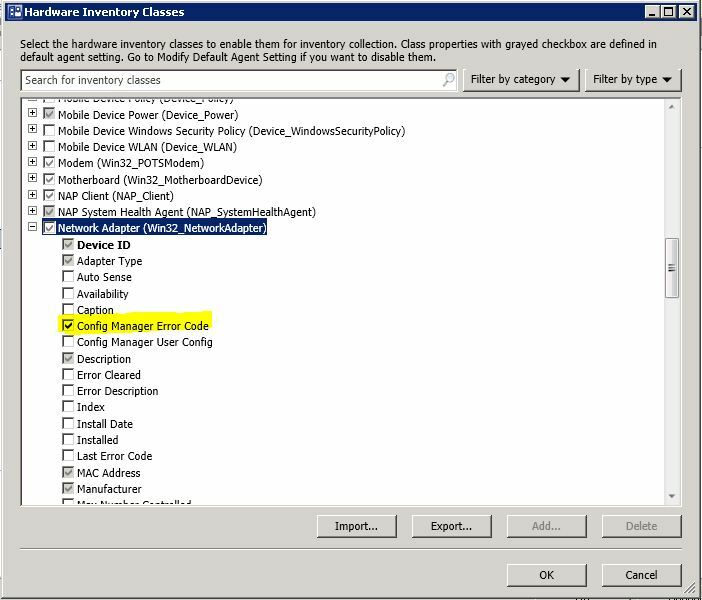 Click OK until you’re back to the ConfigMgr console. You can change the SMS_G_System_NETWORK_ADAPTER.ConfigManagerErrorCode != 0 section to represent a specific error value if you prefer, the error values are in here if you need them. Don’t forget to change your != to = though. You can also change the SMS_G_System_NETWORK_ADAPTER.Description = “Microsoft Teredo Tunneling Adapter” to a value that is more appropriate for you. Now all that is left for you to do is check your collection for the results. You may also want to add in further columns to aid your view, but be aware at the moment (as far as I’m aware) you cannot add in a column for the make and model. If you decided to run the SQL query above your results should mirror between ConfigMgr and SQL, you may need to run an update membership on your collection though. Let me know if you have any further suggestions for this, I’d be glad to get your comments.